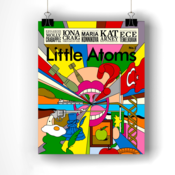 Little Atoms 575 - Temi Oh's Do You Dream of Terra-Two? Steve Brusatte is a palaeontologist on the faculty of the School of GeoSciences at the University of Edinburgh in Scotland. He grew up in the Midwestern United States and has a BS in Geophysical Sciences from the University of Chicago, MSc in Palaeobiology from the University of Bristol (UK), and PhD in Earth and Environmental Sciences from Columbia University in New York. At age 31, Steve is widely recognized as one of the leading palaeontologists of his generation. He has written nearly 90 peer-reviewed scientific papers during his decade of research in the field, discovered and named 10 new species of dinosaurs, and led groundbreaking studies on how dinosaurs rose to dominance and went extinct.&nbsp;Steve is the author of The Rise and Fall of the Dinosaurs . A K Benjamin is a Clinical Neuropsychologist, specialising in diagnostics and acute rehab. Previously he was a screenwriter, spent two years as a contemplative monk and has worked at a number of NGOs, with homeless addicts, with gangs and with children with acquired and congenital neurological conditions. He no longer lives in the UK. A K Benjamin is not his real name. Hanna Jameson wrote her first book at the age of seventeen. Paul Rees of Q Magazine described her as writing like 'an angel on speed'. She has worked for the NHS and travelled the USA, Japan and Europe, developing a particular interest in the US, which led to her studying for a BA in American History. The Last is her fourth novel and her first for Penguin. Adam Foulds most recent books are In the Wolf's Mouth ; The Quickening Maze , which was shortlisted for the Man Booker Prize, and won the Encore Award and the European Union Prize for Literature; and The Broken Word , which won the Costa Poetry Award and the Somerset Maugham Award. His latest book is Dream Sequence.